Welcome by again today, everyone. 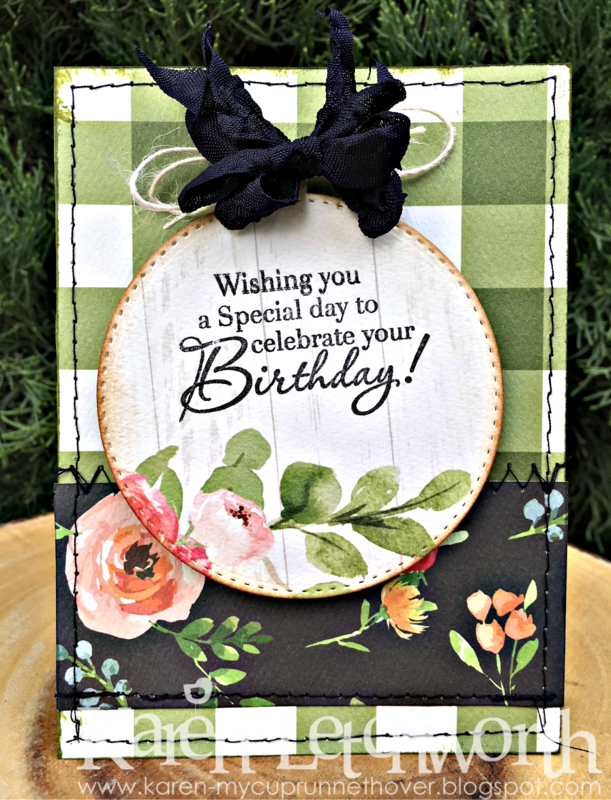 Today I am sharing a couple of sweet little Birthday cards that I made using some new (to me) products. 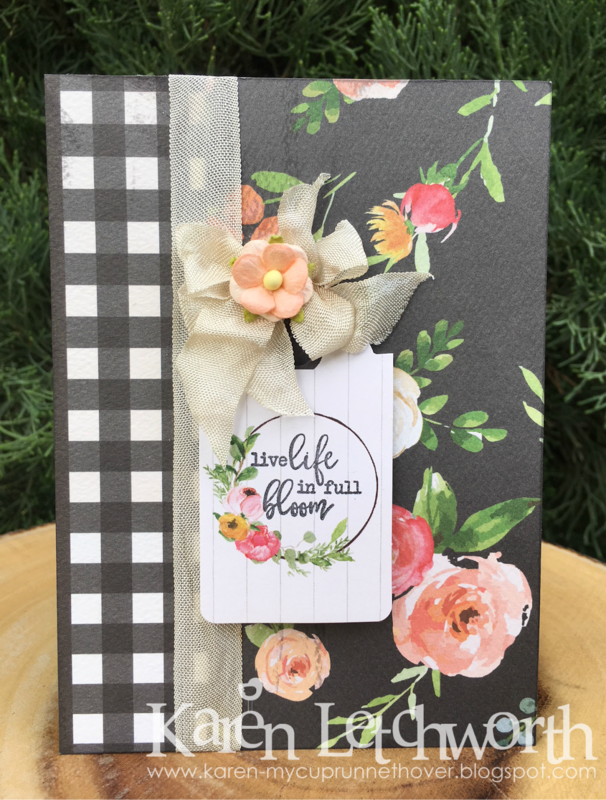 I picked up a line from Carta Bella called Spring Market during my recent visit to the Pine City Scrapbooking Co. while travelling through Minnesota. When I saw that Simon Says Stamp is celebrating their 9th Birthday and having a BIG celebration in their weekly challenge by giving away NINE (9) prizes, I just knew that I wanted to create something to play along the full number of times allowed per week (which is five). These two cards will be my fourth and fifth entries. I'm crossing my fingers NINE times over this week! It's always so nice to learn that you've visited me here on my little blog, and the time it takes you to leave me a comment (when you do) is also greatly appreciated. I read them all....every single comment, and each one blesses and lifts my heart with encouragement and joy. It also gives me the opportunity to stop by your blog(s), meet you (or catch up if we're already blog friends); and of course.....I always gain SO much inspiration when I visit everyone's blogs. There is much to be learned, and so many different styles of beautiful and unique art out there in the crafty world. God has surely given each of us our own unique set of talents, and it's always a great joy to glean knowledge in the crafting community from others. Please just always know that I really do appreciate your visits, comments, blog friendships and artistic inspiration. You are a blessing to me just by stopping by today! I look forward to hearing your thoughts on my trio of cards. Which is your favorite? Simon Says Stamp - Wednesday Challenge Blog - Simon Says HAPPY 9TH BIRTHDAY!! 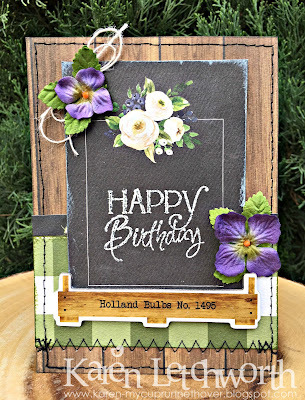 Simon Says Stamp - Monday Challenge Blog - Simon Says A Trio of Something - I created a trio of cards, a trio of stamped Birthday sentiments, each card has a trio of embellishments (flowers, seam binding and jute), and I had a trio of fun! Such a pretty trio of cards, Karen. This new line from Carta Bella is so sweet and you've done a great job with all of it. Thanks for the inspiration with these lovely cards. What a beautiful set. 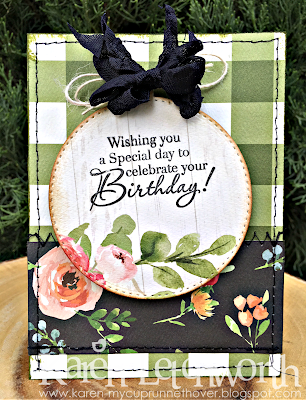 Great cards, colors and designs. Love the black elements mixed with the floral patterns. Thank you for joining us over Simon Says Stamp Monday Challenge. What a gorgeous trio of cards Karen, but the one that REALLY appeals to me is the final, floral one - it's beautiful!! I also enjoy your visits Karen, and appreciate your comments too. thanks for your encouraging remarks on my cards. All of your cards are lovely, such a great variety. The middle card is my favorite. I love the design and the stitching and the colors...the elements all blend together beautifully.